A well laid table can be a visual delight – there is certainly no denying that. Very often it is rightly said that you first eat with your eyes and tableware can enhance your dining experience. Tableware trends are changing and it is now becoming an integral part of the dining room décor. Setting a beautiful table is not a difficult job, nor do you need expensive tableware or silverware. Arrangement and creativity are the key to a pretty table setting. Smitha Murthy, Creative & Managing Director of ANTS says, “combine different materials such as wood with ceramic, glass with metal to create an interesting table setting add accessories and table linen to existing table ware to refresh the look. Table runners add a nice highlight to the table setting. Accessorize with scented candles to bring in a nice cosy feel to your dinner experience.” Experiment with different shapes and sizes of tableware than the conventional out of the box set. Let the centerpiece be the star of the table. “Add life to your tablescape with a vibrant center-setting. Make use of one of those jugs or serving dishes you rarely take out, and decorate it with flowers or fruits. These quick and easy centerpiece ideas will surely do the job. Make good use of potpourri. Just place a beautiful bowl and fill it with potpourri. Add a special touch to your table with some handmade crafts,” says Susan George, curator and store owner – Xanadu. Setting up Linens makes the complete tableware distinct. There is a vast range of table linens and runners in the variety of textures and colours which helps to set up the table. “Colours in neutral with woven textures blended together few of the accent color as lilac and rust adds the charisma. Place-mats create the stylish space for each place setting and woven treated cotton works well too. Square placemats give a contemporary look while round placemats break up an angular tablespace,” says Abhinav Mahajan, Retail Director, Maspar. Table Linen, Embellished Runners, Placemat, Napkins, Tea cozy, coasters with trims addition like laces, cords, micro surface detailing are trending. The latest trend in tableware is co-ordination. Coordinating the table décor with the cuisine you are serving, is in nowadays. Mix and match various colours and textures to create your own look. “Our recommended colour for the season is a pop of deep blue. TUNI’s latest collection has a range of deep blues, greens and a golden neutral along with a pop of yellow. The balance of colours should be maintained alongside the combination of décor and food. Quite often, the table set up looks lovely but we do not consider the colours that the food will add to it. I recommend setting the table in a way that the food balances out the colours rather than causing chaos. 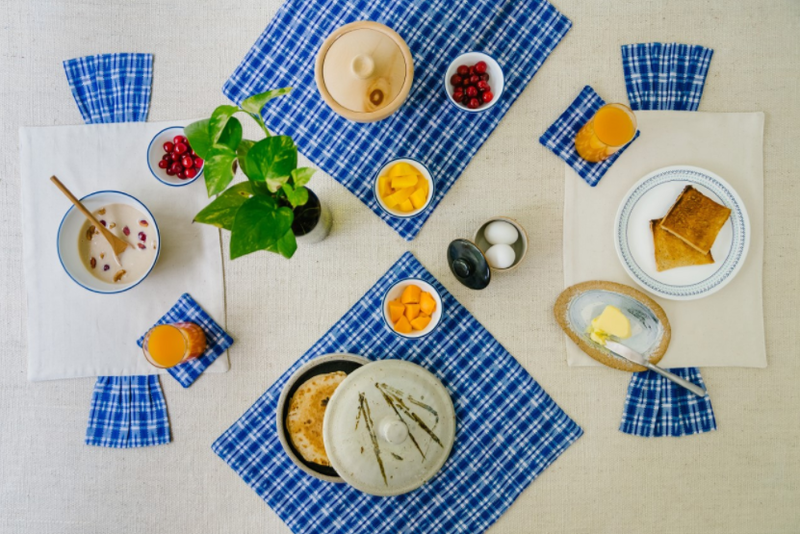 For instance, in a breakfast setting, fruits bring out a robust pop of colour. 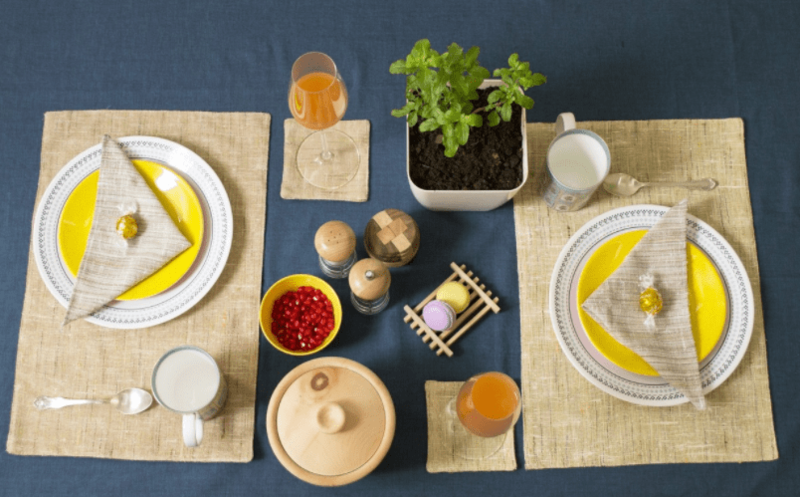 Match the linen to accommodate the yellows or oranges,” says Mrinamayee Kundalia, CEO and Founder, TUNI Tales. If you have to set up your table for a formal dinner creativity can help make a setting that is pleasing. “One of the most important things to note is the right placement of the dinner set. The right placement of the knife and fork along with the place mats, runner and coaster is what meets the eye at first and some guests can be particular about this too. It does not hurt to bring out the fancy cutlery. One can light up a scented lemongrass candle if preparing Asian food to get the taste buds ready for the food. The use of an elegant candle stand will enhance the table decor. A fancy dinner always calls for some special glassware. No meal is complete without something to wash it down. So every fancy drink does require a special glass to grace the occasion,” says George. With so many options to get your table ready, all you need to do now is get cooking. Have fun! Add candles and flowers to enhance the look feel and experience. Collect one off pieces during your travels to create your own exclusive tableware. Go with table serving dishes with smoother surfaces on the inside to aid cleaning and avoid food getting stuck. Please avoid a cluttered busy look. Preferably the tableware home linens need to be stain repellent. Do not skimp on the cloth napkins as they add a nice touch to the dining table. Try to avoid the rectangular placemat as these are getting outmoded now. Adding small decoratives with table linen enhance the beauty of dining area. Always try to keep a separate stake of linens for the table with the seasonal category as well to highlight the table in festive and holiday seasons. This story appeared in Deccan Herald’s Homes & Interiors dated 10th Nov 2017 here.